Orson Scott Card answers questions from the audience after his author talk at the Ferguson Center for the Arts. 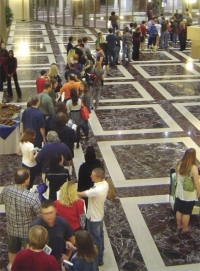 Fans wait in line for author Orson Scott Card to sign their books. Card signed for more than 3 hours after his talk. Amy Tan, left, signs books for a fan following her author talk on September 11, 2007. By working together, the public and academic libraries on the Virginia Peninsula have hosted successful author visits. 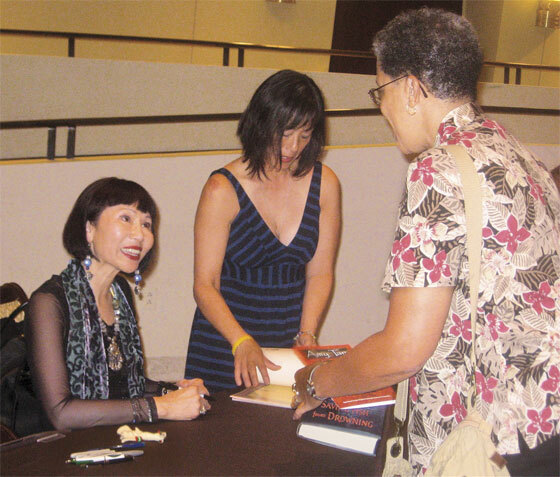 This group, the Virginia Peninsula Literary Consortium (VPLC), presented Amy Tan in 2007, Walter Mosley in 2008, David Baldacci in 2009, Orson Scott Card in 2010, and Catherine Coulter this past October. Surrounded by the James River, the York River, and the Chesapeake and Hampton Roads bays, the Virginia Peninsula is a densely populated urban area of about 600,000 people. Attendance at the consortium’s author talks, which include a Q&A session and book signing, has ranged from 250 to 900 folks. The consortium’s work is carried out by a board that includes one or two representatives from each member library. As the only full-time marketing and PR staffer at any member organization, I handle the planning and promotion for the author events. VPLC’s board meets about once a month and begins planning for each author event about a year in advance. We first determine our budget for the event, what we want it to include, how long it will last, and when and where it will take place. We have settled on a 50-minute author talk, followed by a 30-minute Q&A session with the audience, then a 30-minute or longer book signing. The events are held on a Thursday evening in late October at a university performing arts center. A member of the board offers the welcome, and someone from the community introduces the author. The consortium’s early events also included a private reception for the donors and the author. Because of shrinking budgets and limited attendance, we’ve stopped. After providing cookies and beverages for a few events, we have also discontinued that. The consortium’s board members are committed to presenting these events for free to the public. With total costs ranging from about $5,000 to tens of thousands of dollars, support comes from the consortium’s member libraries, Friends groups, and educational foundations, as well as from community organizations and businesses. We send solicitation letters to local and national library vendors and to community organizations and businesses that might be interested in supporting the event. Those who attend the events and receive tickets are asked to sign up for our email newsletter, which also includes solicitations for donations. The consortium’s financial agent is one library system’s 501(c)(3) foundation, so that donations are tax deductible and may be made online through PayPal, by mail, and at donation boxes at the author events. Incentives are provided to donors at different giving levels and include tickets for priority seating, ads in the evening’s printed program, recognition on the website and email newsletter, and a book signed by the author. The Virginia Peninsula Literary Consortium is fortunate to have local universities with outstanding performing arts centers. Our venue considerations include the space required for the presentation and book signing as well as any other planned activities. Some venues have restrictions on catering, bookselling, and more. Some have required us to purchase event insurance (and provided the names of such agencies), which costs less than $500. 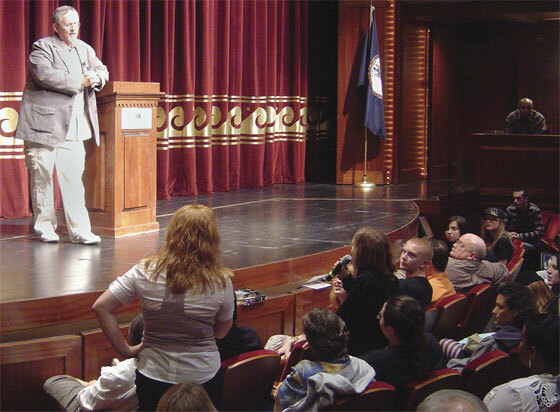 Venues may provide ushers or other staff to help with setup, breakdown, signs, parking, transportation, requirements for disabled visitors, seating, passing out programs, taking tickets, handling microphones for the Q&A session, handling the book-signing line, and other duties. Our venues charge for the services they provide, and our members and volunteers handle others. Consortium board members gather recommendations of potential authors to invite from book clubs, Friends groups, other groups that meet in the libraries, and those on our mailing list. Board members also compile lists of their libraries’ top-circulating authors. These lists are narrowed down based on the authors’ availability, speaking fees, and audience appeal. We keep our own database of potential authors that includes contact information, speaking fees, travel requirements, and major works, and we add to it each year as we do this research. We use several methods to contact authors. Some have their own websites that include information on appearances. Others work through their publishers or speakers’ bureaus and agencies. I have worked with the Royce Carlton agency and the Steven Barclay Agency, both of which are willing to help me contact other authors in addition to those they represent. Because it often costs more to use an agency, we try the other options first. But for some authors, it is the only option. And some are only accessible through personal connections or don’t accept speaking offers at all. When we have narrowed our choices down to five to 10 writers, I send them inquiry letters. The letters include information about the consortium, our past successful events, the venue, a range of possible dates, and what we would like the author to do. I include the fact that we take very good care of our authors, often personally seeing to their needs while they are here. I ask about their availability, speaking fees, and travel requirements, making sure to be explicit that this is only an inquiry and not an offer at this step. Will the author have any traveling companions? If so, who will cover their travel and lodging costs? What ground transportation will we use for getting to and from the airport and getting between the hotel and the venue? Once everything has been agreed upon by both parties, I send out the contract along with the W-9 tax and photo-release forms for the author to sign. The contract details all of the specifics of what each party is responsible for doing and paying for, total payment, the date, the time, the place, and whether the payment should be made directly to the author or to the speakers’ bureau. If our guest doesn’t provide this information, I ask for it well in advance so we can be prepared. I also ask the author to provide a biography and photos that we can include with our news releases and other publicity materials. I find out whether the author is willing to do news media interviews, and if so, whether he or she prefers them to be conducted by email, by phone, or face to face. It is also very important to determine book-signing requirements. Some authors will only sign their name, while others will write out personal messages by request or if written on sticky notes. Some want the book opened to a certain page to sign or will only sign certain books or need to have certain writing utensils provided. We’ve had some authors sign books for 30 minutes and others for several hours. Some want to be sitting, while others want to be standing. We make arrangements for our local Barnes & Noble Booksellers to sell the authors’ books for us. (This was previously handled by the host university’s bookstore.) Barnes & Noble asks that the author sign a few copies to sell in its stores. Even though our events are free to the public, tickets are required because of limited seating. We provide tickets about 1 month before the event on a first-come, first-served basis, two per person, while supplies last at each consortium library. We try to limit people taking tickets but not showing up for the event by giving out 10% more tickets than we have seats for, based on our venues’ recommendations. We ask those who take tickets to return them if they are unable to use them, and we keep waiting lists for those tickets. The day before the appearance, staffers call ticketholders from their own libraries to remind them about the event (if they’ve provided their phone number for that purpose). Once we have only a few tickets remaining, we consolidate them at one central distribution point. We encourage the public to call the library beforehand to make sure that tickets are still available. At the event, those with tickets are seated first, up to 5 minutes before the start, and then the remaining seats are open to members of the general public who don’t have tickets. (We have a separate area for those who are waiting to be seated and do not have tickets.) We have never had to turn away anyone from any of our author events, although we often have standing-room-only crowds. We begin publicizing our author events as soon as we have the signed contract, usually about 6 months or more in advance. We work with college graphic design instructors to host a design contest for students, and VPLC board members choose one student’s design for the posters, bookmarks, tickets, and program cover. I send out several news releases to local, state, and regional news media and also email newsletters to subscribers. I work to get the author featured on local radio talk shows and in articles that are published around the time that we begin to pass out the tickets. Our libraries post news on their websites, Twitter accounts, and Facebook pages. Authors who have their own websites and social media pages also post the events. Because the tickets are snapped up quickly, we have used very little paid advertising. During the event, I take lots of pictures and notes to use for the follow-up news releases, newsletters, websites, and social media pages. Closer to the big night, I find out from the venue’s event manager when the author needs to arrive for the sound check. We also detail where the author should park, which entrance to use, where the greenroom is located, and how he or she will be notified when it is time to take the stage. Once at the venue, we set up a display about VPLC, and members volunteer to man it to answer questions, to encourage attendees to sign up for the email newsletter, to pass out library information, and to take donations. We also make announcements about the event’s videotaping and photography policies and book-signing requirements. Planning for our author events requires a lot of work and meticulous attention to details, but it pays off when we see how much the public benefits from the events. To learn more about what we do, go to www.thevplc.org. Karen L. Gill is community relations and programs coordinator at Newport News Public Library System in Newport News, Va. She holds an M.S. from Kansas State University in Manhattan, Kan. Her email address is kgill@nngov.com.